The fish did not look good. He wasn’t swimming around. He was tipping over to one side. The clock was ticking for this poor dude. The next day, my son’s poor Beta fish was dead. He had turned a pale gray overnight and was floating belly-up in the tank. My son was heart-broken. With tears streaming down his face, Vman told me his fish was dead. Falcon (yes, he did name the fish after another animal) had been his constant companion, greeting Vman every morning and lulling him to sleep every night. Falcon’s tank light was the perfect night light, making Vman feel secure in his room in the dark of night. And now Falcon was gone. What was I supposed to say? And how do you talk to a seven-year-old boy who rarely talks about anything emotional? 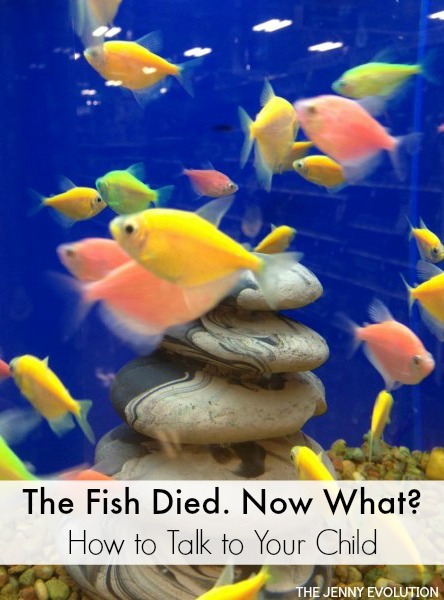 As a parent, I wondered what to do when the fish dies! Allow your child to feel sad. As parents, we often want to shield our kids from feeling sad, but feeling grief is so important for children to process their own emotions. Allow your kid to cry, vent and embrace how they are feeling. Giving your children permission to process their emotions will develop the building blocks for managing more complex situations as they get older. Give your child space if they need it. I’m a talker, so my first instinct is to discuss whatever is going on. However, I recognize my boys need their own space. After Vman’s initial cry over his fish, he asked if he could stop talking it. I believe he was overwhelmed by the situation and his sadness. I allowed him to go hang out in his room on his own, and once he had been able to think about his fish, he was able to come downstairs and talk about what he wanted to do next. Give your child a say on how to honor his pet. My husband and I recommended to Vman the family go into the bathroom, say goodbye to Falcon and flush him down the toilet. We also gave him some alternatives on how he could honor his fish. Ultimately the decision was his. The whole process took about one minute but it let Vman say goodbye properly. He was still sad the next morning, but he felt like a chapter had been properly closed. We have a new fish in the family. Again, it is named Falcon. But he’s a different color so he feels like a new friend rather than a replacement. Has your child ever lost a pet? How did you handle it? Great post! I think that the death of a pet can be such a teachable moment. We had a couple cats die, one of which my son could clearly remember and we really encouraged him to be a part of the process. One he was way too young to understand, but the other one he could participate in the burial and saying goodbye. He is four now and the cat died two years ago. He still remembers her and asks about her and tries to understand what it means to be dead. It is such a tough concept. Of course it broke my heart to try and go through it with him, making it all that much harder for me. I’m so sorry to hear about your cat. That’s so sweet that he still talks about his cat even though she passed away two years ago. That obviously made such an impression on him. But how wonderful that you included him in the process. Everything is a test, eh? 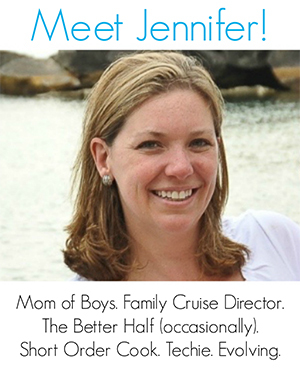 You are a great mom to care a whole lot. Poor Fishy. Oh no! So sad, I remember when my daughters fish died. She was devastated. I had her draw a picture of her fish and she hung it by her bed and talked to it every night. A few weeks later, we got another fish and she was over it 😉 kids! Thanks for linking with us for wine’d down Wednesday! Useful and compassionate advice. Long live Falcon II. Allowing your child time is the best medicine. My son has had several pets (dogs most of all) and he is a grown man now that still talks about how much he loved them. You have a great little man who will continue to grow and learn the value of love by your example. I know how it feels to lose a pet. I have 7 goldfish and I love each one of them. I know every gold fishes name and never get confused which one is which. I was heartbroken when me fish Peachy, died today. She was a wonderful fish but she was different. Her mouth/jaw was dislocated so it was harder for her to eat. For two days she wouldn’t eat and she was just staying in one place. After a while she stopped breathing and died. RIP Peachy I will miss you!